Pulling on cozy sweaters and sturdy boots isn’t the only way to stay warm this season. Adding decorative lights to a home’s interior and exterior helps bring a festive glow that can create a toasty feeling as easily as hot cocoa or Santa’s lap. While Christmas often includes a number of must-have traditions, there are always a few new ideas to help keep the season feeling fresh and fun. Here are some of the emerging lighting trends for 2014 that will ensure the celebrations are both merry and bright. Whether strung up inside the house, such as on a stairway bannister or across the fireplace mantle, a garland can instantly add festive cheer in a multitude of ways that suit the house and occupants’ individual style. Simple, crafty garlands made of paper and twine are even more charming when enhanced with a string of lights, in colours to match the décor. Geometric shapes, snowflakes, and pine trees are just some of the cut-outs to try. This endearing lighting trend is ideal for the bedrooms, especially for younger kids with eyes opened wide in anticipation of the presents to come. Take an old Hula Hoop and wrap it in lights. Yellow or colourful light styles work best here, whether they’re mix and match or a single shade. Make sure to include string lights hanging down off the sides. Hang the hoop horizontally from a light fixture, fan, or just the center of the room for an eye-catching and jubilant display. In years past, many folks were fond of elegant white lights. They are simple and warm, but they also lack an unabashed festiveness. This year is all about colourful lights, either all a single shade or bunches of different, Christmas-friendly hues. White is definitely out, but for homeowners who adore simplicity, yellow is the best option. Neon lights are also popping up, in case the standard red, blue, and green are too staid. It definitely involves a lot more work, but if there’s a will, there’s a nearby crowd of onlookers happy to appreciate the effort. Setting colourful lights to dance to music instantly upgrades any exterior space. It’s possible to do this very simply, with all the bulbs simultaneously blinking on and off to the beat. Some people, however, manage to create highly involved shows with chuckling Santas, flying reindeer, and scenes of falling snow. Any animation, big or small, is welcome this year. Sharing the beauty, warmth, and welcoming of a Christmas tree with the neighbours is a new trend this year. 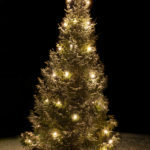 Of course, the main tree will stay indoors, but by adding wrap-around lights, decorative garlands, and even ornaments to planted trees in the lawn, more people can enjoy the spirit of the season. Young kids may even believe Christmas trees grow up from the ground this way. A step away from the Claymation-style winter wonderland and a step toward naturalistic, dressing up the back and front yard can also be done minimally, with soft yellow or even matching green lights that are wrapped around the green needles of deciduous trees and hardy bushes. A more natural take on decorations still creates a merry feeling, but without the conspicuous holiday drama that is not always for everyone. Mass-produced Christmas scenes and pre-ordered designs are out. People are trying their hands at totally customized lighting designs that suit the unique features and layout of their homes. Hanging baskets on a front porch are gussied up with a few randomly placed yellow LED lights, bird baths are enhanced with spouts of blue string lights to look like a pouring fountain, and colourful spotlights are aimed at privacy bushes for a warmer ambiance. 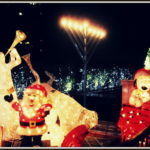 Homeowners are encouraged to consider their house’s design, materials, and feature functions when adding seasonal lights. 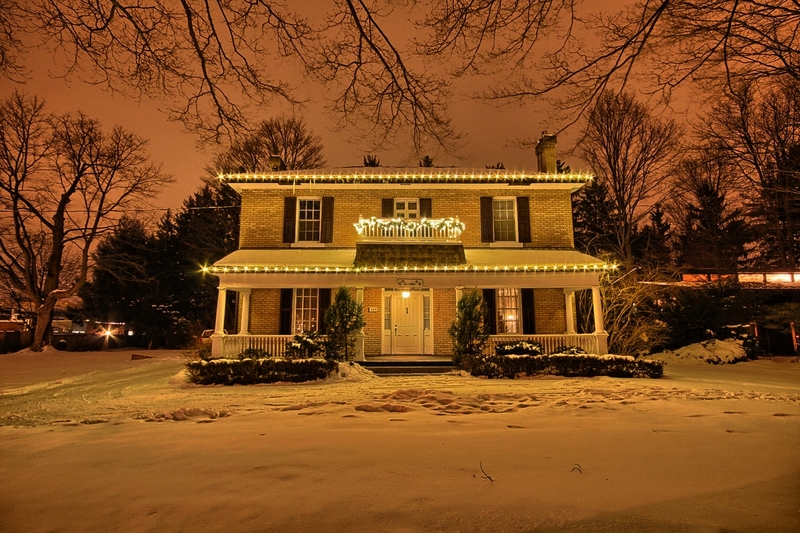 Christmas is the perfect season to consider how to light the exterior of the home. New trends in seasonal lighting are all about festive colours, customized features, and whimsical but natural-looking elements that can look gorgeous year round. We can help keep your property trendy and stylish with detailed, custom lighting designs and installations. Request a consultation today and get your lights ready before the snow falls.